The Voltron books arrived and they’re very shiny! 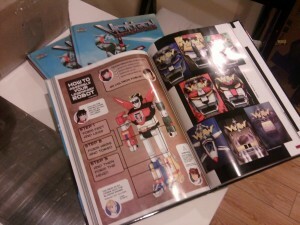 My piece “Voltron 101” is on page 138. Check it out at the Voltron Webstore! The following are some of my favorite illustrations in the book and really stand out for me. – Sean Moore’s DOOM Propaganda Poster-esque illustration is fun. – Brent Schoonover’s inspired vintage comic book cover ala Jack Kirby is just wonderful. – Andrew Griffith’s piece is a very cool what-if scenario with Voltron as a kind of Steampunk Viking warrior. – Fernando Peniche Vargas’s illustration of BOTH Lion and Vehicle Force Voltrons is not only inclusive but also super dynamic! – Michael Borkowski’s depiction of Voltron vs a Robeast is pretty kickass. I recently participated in February 1’s Hourly Comics Day. You can read how my day went on my blog here. Also, uploaded a few new pieces to the illustration galleries. 3 Pages in Original Comics – Can’t seem to get them to show up properly so you can read them full-size here instead.